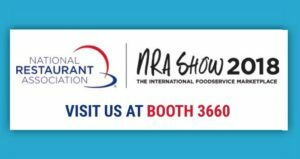 ITV Ice Makers will be present at the NRA Show from 19th to 22nd of May 2018, the International Foodservice Marketplace. One more year, ITV, as a leading company in the sector, will present its novelties in ice machines, responding to new trends and market needs. You can visit us at the BOOTH #3660.